. Last edited 19:42 4 Feb 2019. Users licensed for the data service can access our Brazil data. 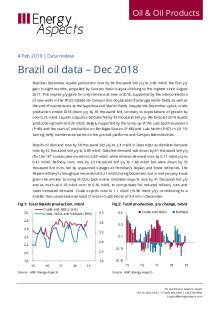 Brazilian December liquids production rose by 66 thousand b/d y/y to 2.80 mb/d, the first y/y gain in eight months, propelled by Campos basin output climbing to the highest since August 2017. This implies y/y gains for only the second time in 2018, supported by the interconnection of new wells in the FPSO Cidade de Campos dos Goytacazes (Tartaruga Verde field), as well as the end of maintenance at the Sapinhoa and Marlim fields. Despite the December uptick, crude production ended 2018 down y/y by 35 thousand b/d, contrary to expectations of growth by over 0.25 mb/d. Liquids output ex-biofuels fell by 39 thousand b/d y/y. 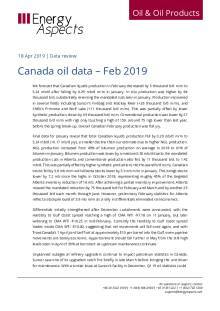 We forecast 2019 liquids production growth at 0.29 mb/d, largely supported by the ramp-up of the Lula South expansion (P-69) and the start of production on Berbigao/Sururu (P-68) and Lula North (P-67) in Q1 19, barring hefty maintenance works on the pre-salt platforms and Campos Basin declines. Brazil’s oil demand rose by 58 thousand b/d y/y to 2.4 mb/d in December as distillate demand rose by 32 thousand b/d y/y to 0.89 mb/d. Gasoline demand was down by 81 thousand b/d y/y (for the 16th consecutive month) to 0.89 mb/d, while ethanol demand rose by 0.11 mb/d y/y to 0.41 mb/d. Refinery runs rose by 23 thousand b/d y/y to 1.68 mb/d but were down by 33 thousand b/d m/m, led by unplanned outages at Petrobas’s Replan and Rnest refineries. The Replan refinery’s throughput remained at 0.21 mb/d during December, but in mid-January it was given the all-clear to bring its CDU back online. Distillate imports rose by 41 thousand b/d y/y and as much as 0.10 mb/d m/m to 0.30 mb/d, to compensate for reduced refinery runs and meet increased demand. Crude exports rose to 1.1 mb/d (+0.38 mb/d y/y), contributing to a smaller than usual seasonal build (7 mb) in crude stocks of 4.4 mb in December.